Serological Pipettes | Tamar Laboratory Supplies LTD.
High quality serological pipettes from 1 to 25 ml are available for a range of applications. Manufactured from clear polystyrene, these sterile, individually wrapped pipettes are certified non-pyrogic for maximum safety in use. They are supplied in clear, micro particle and static-free paper/plastic packaging for easy identification and tear through. 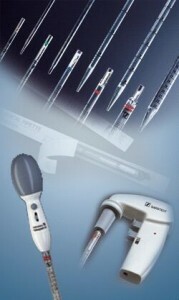 Alternatively, pipettes are available sterile with 25 pieces in a bag. The new 25 ml pipette has special orienting lugs on the mouthpiece to ensure a secure fit to most pipetting devices. For use with vacuum pumps, an individually wrapped 2 ml aspiration pipette is available without a cotton wool plug. This pipette is also available non-pyrogenic. The SARSTEDT M-Sarpette®, a manual bulb pipettor, together with the Automatic-Sarpette®, meets almost every user‘s pipetting requirements.